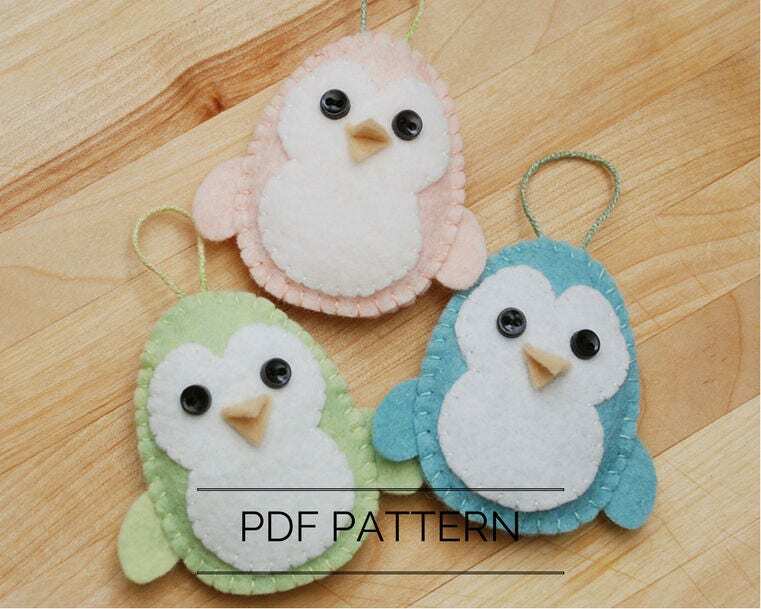 Penguin ornament in traditional colors. Make your own with an easy-to-follow pattern. Hand sew your own little felt penguin ornaments. These pattern includes instructions to make a 2 and a half inch felt penguin ornament (not including the length of the loop). You may print the pattern smaller or larger. This won't affect the directions. This penguin pattern is a beginner sewing project that is easy to finish. You can customize your ornaments and make it whatever color and size you want. This pattern is designed so that you only need to print one black and white page of pattern pieces. You can read the color instructions from your computer, tablet or mobile device. If you would like to print all pages they print well in color or grayscale (to save that expensive colored ink). Please note that I do not offer refunds or exchanges for downloadable content. Pattern instructions are in English only. Patterns are protected by copyright. They may not be copied, sold or redistributed. Designs, tags, descriptions, and photos are also protected. Cute pattern! We made these on a girls weekend with people of all levels and it worked out perfectly!! sent to my niece.. she loved it. she sent me a photo and it turned out absolutely adorable.